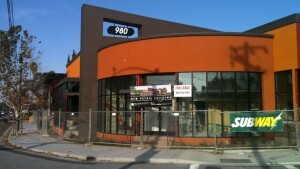 A new Subway franchise is coming to the new retail building at 980 South Winchester Boulevard. The new Subway sign appeared around Friday, December 18. With an existing Subway location at Santana Row and another at the corner of South Winchester and Campbell Avenue, this makes Subway the third most common franchise on South Winchester Boulevard. The most common is 7-11 with five locations, although the 7-11 at South Winchester and Sunnyoaks Avenue was recently closed due to a fire on November 20, tying it with Starbucks with four locations. This entry was posted on Saturday, December 19th, 2009 at 4:21 pm by John Vink	and is filed under Uncategorized. You can follow any responses to this entry through the RSS 2.0 feed. You can leave a response, or trackback from your own site.